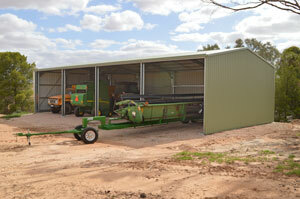 MACHINERY SHEDS – Protect Your Assets! 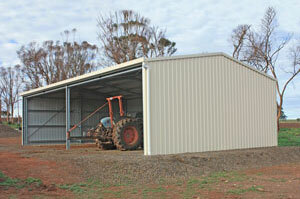 "Grant Sheds “Aussie Tough” Galvanised C-Section Shed Range"
Farming is a tough job. It takes a tough attitude and tough equipment. When you’ve worked hard and invested in your expensive farm machinery you don’t want them damaged by our harsh Aussie weather or stolen or damaged by dirty, rotten low-life thieves. Maybe, but the truth is you want your valuable farm equipment protected, safe and well looked after. 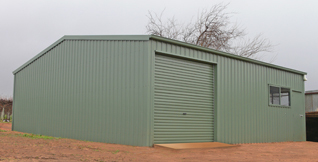 I’m sure you’d also like to have all your smaller vehicles, implements and workshop equipment stored neatly and out of harm’s way so that when you want to use it, it’s in good working condition. 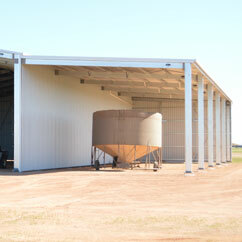 That’s where an “Aussie Tough” Grant Sheds Machinery Shed provides you with protection and peace of mind. 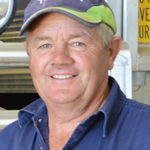 Sun and heat damage from our searing hot summer sun can quickly damage the paintwork as well as the internal upholstery and the rubber hoses and plastic fittings on your farm tractors, harvesters, headers and spray units as well as other vehicles and equipment such as air seeders, trucks, utes and ATV’s. 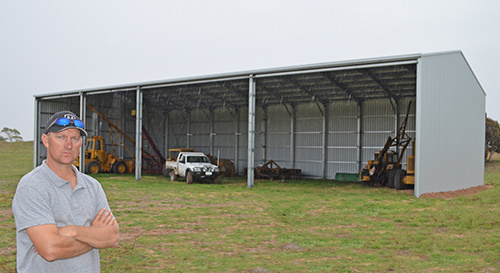 Protect these items under cover of an Aussie-Tough Machinery Shed from Grant Sheds and you’ll be increasing the re-sale value and extending the life of your vehicles and equipment compared with ones that are left out in the weather. Any sign of sun damage, such as fading duco, cracked vinyl dashboards, rubber hosing and plastic parts will immediately tell a future buyer that this vehicle hasn’t been well looked after and will automatically cause them to dramatically lower their price offer, or even walk away, disinterested. And if it’s a change-over price you’re seeking when considering a new or second hand farm vehicle through a trader, surely you want the highest trade-in price you can get. Wind Storms & Hail May Decimate Your Farm Vehicles! We all know that storms bring high or even gale force winds that can topple trees or blow debris across paddocks and properties to badly damage anything left out in the open. Whether it’s a tree branch that falls and crushes your spray cart or if it’s flying debris that scoots along with the wind to scrape up against your tractor, leaving it scratched or dented, surely you’d prefer to avoid that. And then there’s hail ! 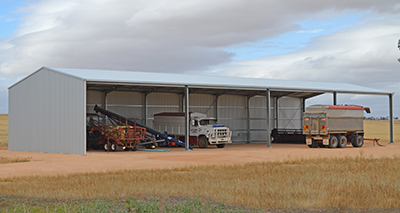 With a thunderstorm approaching, you always worry about the catastrophic damage hail can cause to your crops and also to your expensive harvester or other farm vehicles. While you can’t protect your still-growing crops, you just don’t want that awful possibility of your vehicles being pock-marked with dents because you just didn’t have anywhere to safely store it undercover. You know that statistics demonstrate the extremely high level of theft from rural properties. It’s not a matter of IF you’ll have items stolen from your property but WHEN! And if your costly and precious vehicles or personal items are left unprotected, there’s every likelihood that you’ll be an easy target for thieves to take advantage of your lack of security. You’ve worked too long and hard to have these opportunistic low life’s steal your stuff. 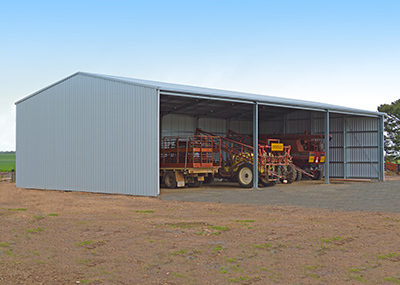 By storing your valuable tractors, trucks and other farm equipment securely inside a super-strong Aussie made shed, you’ll have much greater security and peace of mind. 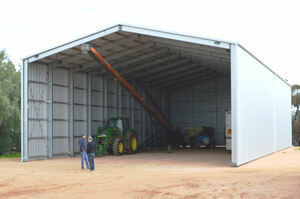 Your new Super-Tough Farm Machinery Shed will have so many uses that you’ll wonder how you ever did without it. 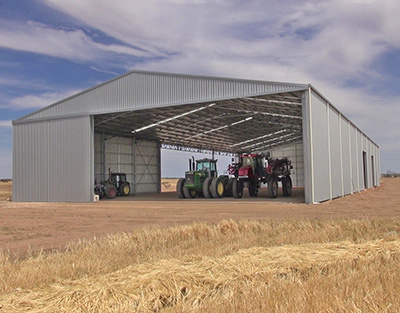 Of course, when you decide it’s time to protect your farm vehicles and equipment, you’ll likely be looking to invest in a Farm Shed that’s just right for you. 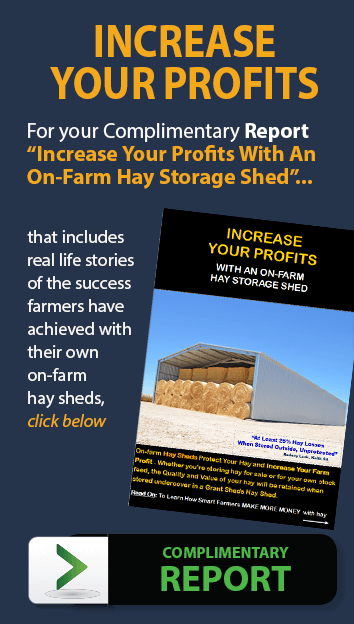 But often, new buyers don’t know what’s available or what they really need when designing the size, layout and accessories for their new shed. And so you may be left at the mercy of a fast-talking, high pressure hustler … not unlike a 4th generation market stall owner in an over-crowded, smelly fish market in a third world country! However, our team at Grant Sheds is different … and instead, we’re dedicated to helping you. 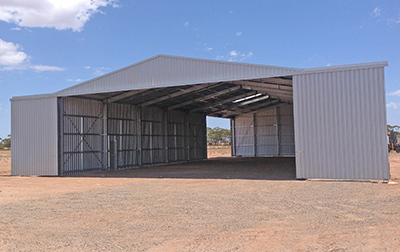 Grant Sheds Farm Sheds are specifically designed with hard-working, Aussie farmers in mind. For The Protection Of Your Farm & Family Income? 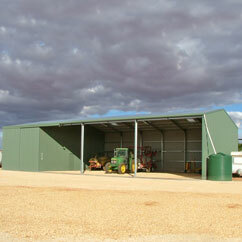 Grant Sheds has a huge range of high quality sheds for your rural farm property. They are perfect for secure parking of your farm vehicles and undercover protection from the weather. 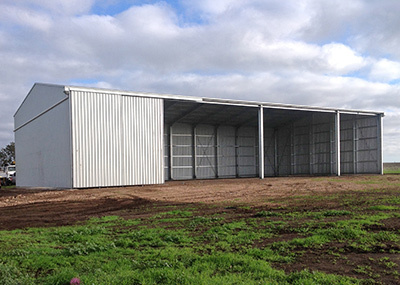 These sheds have been designed to be easy to build. 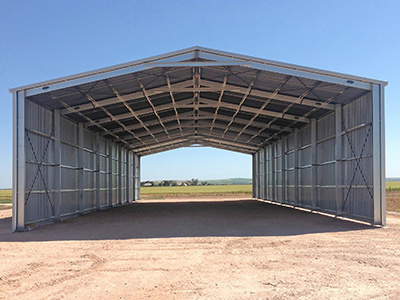 So if you know a local builder or you’re happy to build it yourself, you’ll certainly be glad you invested in a farm shed from Grant Sheds. The time you’ll save over many others will be dramatic. “My sons and I erected the shed ourselves and found it very easy. There were absolutely no problems at all putting the shed up. 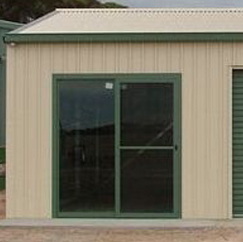 Alternatively, our experienced shed builders may erect your new shed so that you don’t have to worry about the hassle or inconvenience of building it yourself or finding your own shed builders. 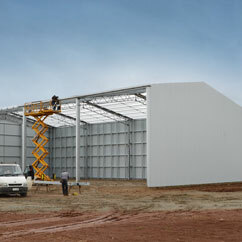 This building service is available throughout country South Australia and much of western Victoria and New South Wales. 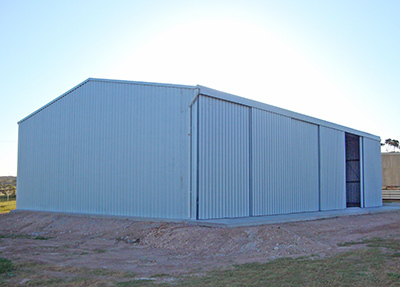 With multiple teams of dedicated shed builders, with up to 30+ years of building experience each, we know you’ll be delighted with their high level of workmanship. 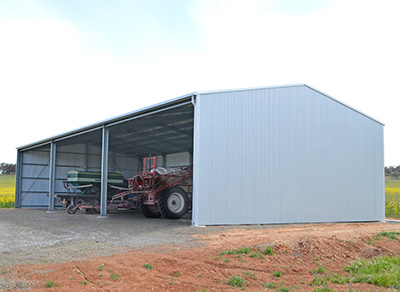 Most farmers who have had a shed built by our shed erectors are surprised and delighted with their speed and quality of workmanship. And they’re all great blokes too! “An excellent finish product. A very neat shed. I was privileged to have the service of your building team. They were a totally professional team in all aspects; friendly and capable. 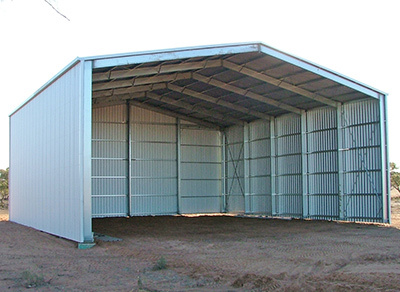 When You Invest In A Machinery Shed From Grant Sheds. 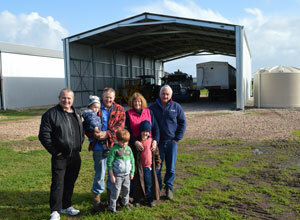 Many people worry about how to get Local Government Building Approval for their new shed. We understand that it can seem quite daunting. There are generally two tiers of approval required in most cases. But there are also some circumstances where Building Approval is not required. Planning Approval is all about whether you are allowed to build where you want to build. Heritage areas often have very specific building requirements. 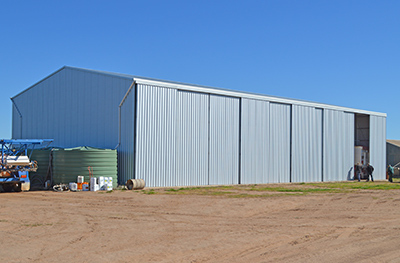 This planning aspect of seeking approval to build your new shed is often subject to your own local Council or Shire by-laws so it isn’t necessarily the same set of rules in all areas. Building Approval is more about the structure and whether it is considered strong enough to stand up against strong winds. And there are different terrain categories depending on the topography of the area where you’ll be building. 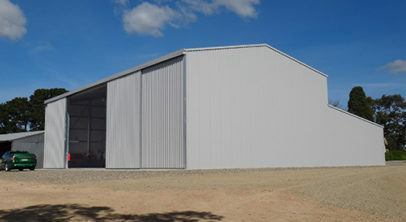 For this, a full set of site specific Engineering Calculations & Computations is required as proof that the shed has been designed correctly. Those calculations then have to be checked by a second, independent design engineer, as proof that the first one did the job correctly. Phew… it can be a lot of hard work! That’s where we take all that hassle away for you! We provide the full set of Engineering Calculations that you’ll need. And to make things even easier, they have already been certified by a 2nd design engineer. So the Building Approval aspect of getting your Council approval will usually be easy! We also supply the required Plan and Elevation Drawings which will show the size of your shed and the layout of doors, openings and accessories. We’ll need some information from you too, but that’s all discussed and covered with you to ensure we make it easy for you. 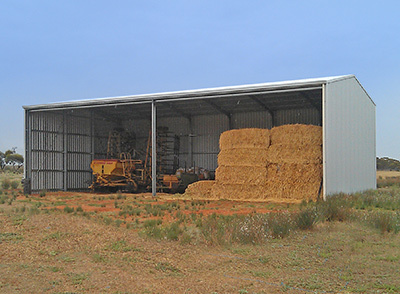 While this web page is about Machinery Sheds, these same sheds can also be used for hay storage or, with alterations, can be used for other forms of fodder storage. 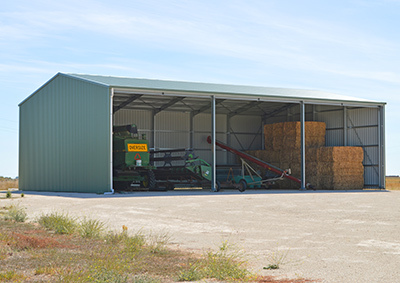 New tax depreciation measures, that include sheds for fodder storage mean that you may now be able to claim depreciation on your shed over just 3 years instead of previously up to 50 years. See below for further information. 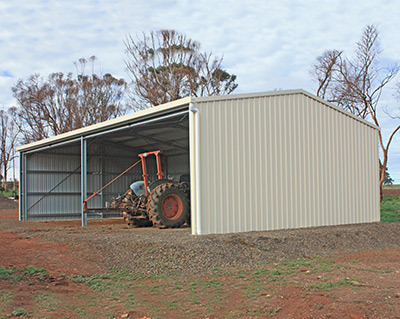 Grant Sheds Machinery Sheds for your farm or rural property are available in a wide range of styles, sizes and colours, too numerous to list in full here, but here’s an idea of the range. 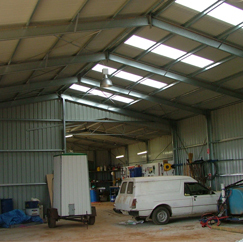 Wider bays can be arranged with wide-bay beams in many cases. Entry can be from the end or side of the shed. 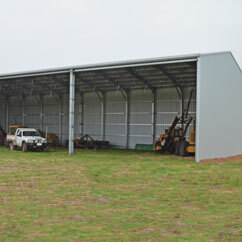 Extra wide bays for your wide machinery can be arranged with wide-bay beams in many cases. 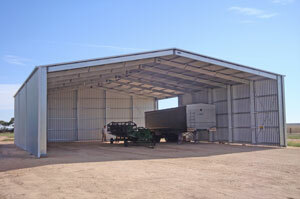 Extra wide bays for your largest farm equipment can be arranged with wide-bay beams in many cases. *Other custom made sizes may be available so if you have a specific requirement that isn’t met in these general sizes, please feel free to make a request. 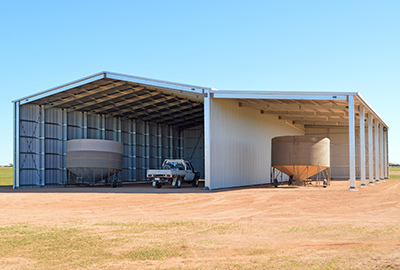 We know that shed sizing, layout and designs can become confusing, so please just discuss your needs with us and allow our team to guide you to the most suitable and cost effective shed design for your specific circumstances using our Exclusive Farm Shed Design System. Open on one side with 2 x 6m beams. 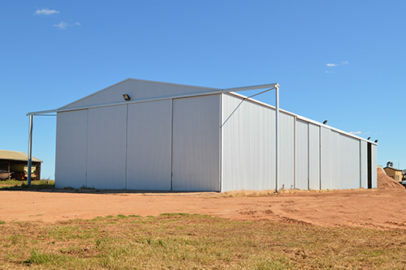 Ideal Shed For Small Farms. 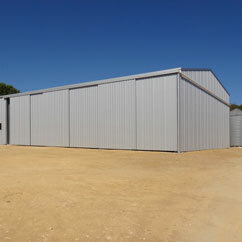 Fully enclosed with 3m wide sliding doors along one side. 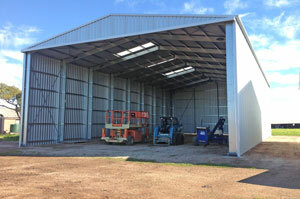 3 x 6m beams which would be more economical if you don’t need the 9m openings. 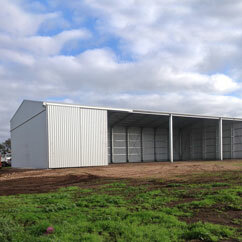 Sheds in spans greater than 15m span are shown on our MEGA SHEDS page. Beams allow removal of one or more columns to give wide openings. 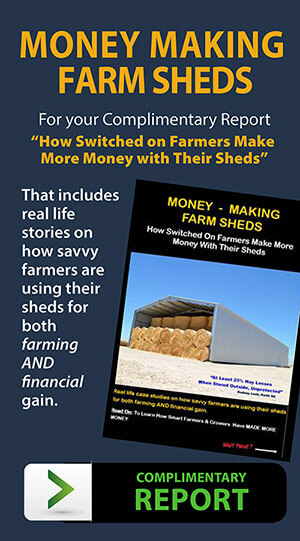 Grant Sheds “Easy-Roll” sliding doors secure your shed. 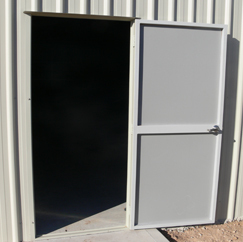 The heavy duty door frames and either top or bottom roll mechanisms ensure your doors are easy to open, regardless of the size. 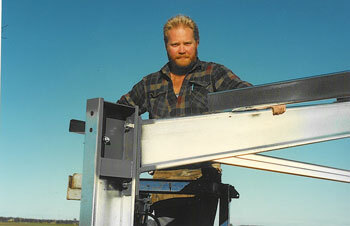 If you want to be able to fully open the sliding doors on the end of your shed these outrigger frames allow the doors to be slid open past the sides of your shed. 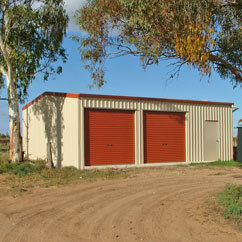 Ideal for a workshop or as a secure area for your most valuable or most easily stolen vehicles & equipment. 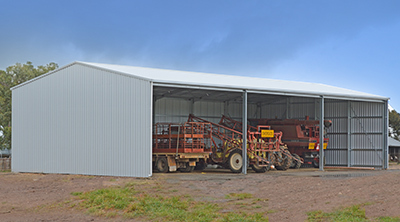 Vertical rise roller doors are suitable for single bay openings but not generally for the very wide bays often required in Aussie farm sheds. 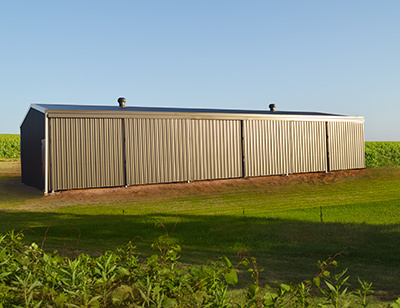 A leanto can be added to your new farm shed to provide additional undercover storage. Specially designed sliding door frame to fit in a “shed” wall, not a house wall. 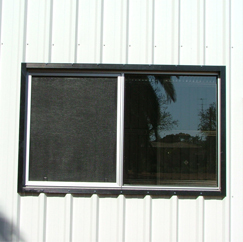 Glass sliding window specially designed to fit in a shed wall. Skylights bring daylight into your shed. 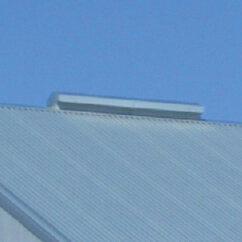 Vented ridge cap, available in short lengths (as shown), long lengths or full length of shed. 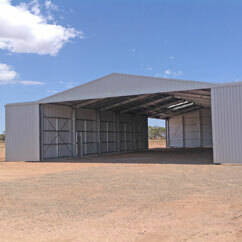 Local builders in your area will find these sheds easy to build. 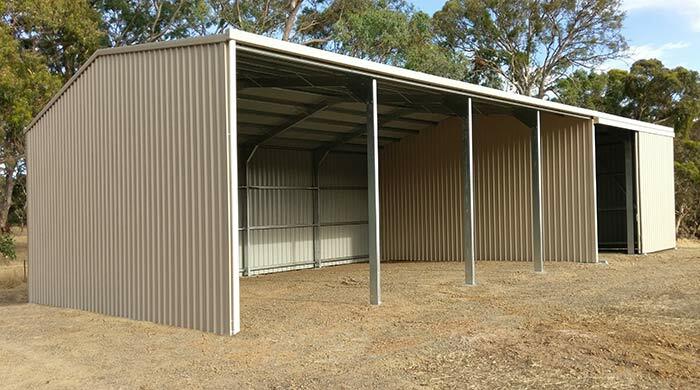 The investment in your new “Aussie Tough”, Grant Sheds Machinery Shed will vary depending on the size, construction style, accessories required and the location of your farm. Importantly, these measures are available to all farmers. 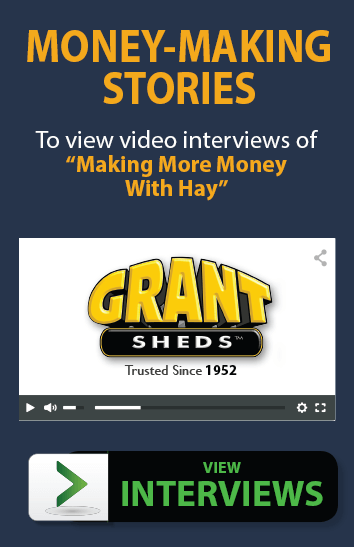 “Grant Sheds have been great. Their helpful advice gave me the confidence to go ahead with the new shed I’ve been dreaming of for so long. I was concerned about other companies sheds and I walked into a Grantshed that’s built locally here and I was really impressed. And it was an obvious thing as soon as I walked in to this other Grantshed-the quality just stood out compared with other sheds. After ringing around David Rasheed went with GrantSheds due to his positive experience with the sales team. Particularly help with designing the shed size and layout so that he got a higher shed than he originally intended for not much more money. 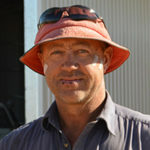 Greg “Cudgee” Warmington needed another shed to protect the family’s road trains and to give them a workshop for servicing. 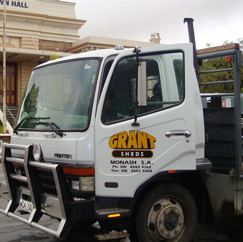 “It was Grant Sheds reputation and a Grant Sheds building contractor he knew which made the choice easy. Building the shed was made easy. It’s good value as we were busy with harvest. 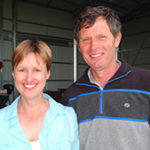 Far West Coast Farmer, ‘Mildy’ Chandler has invested in 7 sheds from GrantSheds. “If you’ve got equipment, it’s got to be in a shed and I’ve had a good exprience with Grant Sheds in the past so it’s every reason why I’d buy another one.